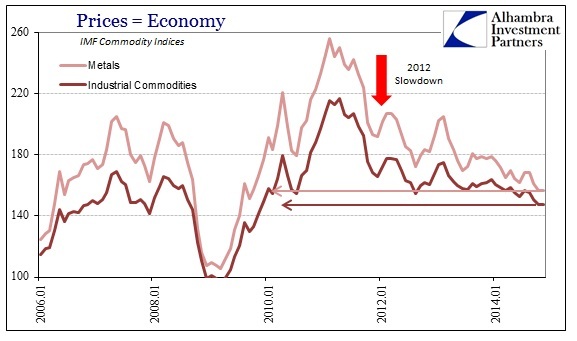 Not surprisingly the Commodity Price Index compiled by Scotiabank plunged in December to levels last seen during the global financial crisis. The index was down over 10% compared to November and 15.4% year on year which the bank ascribes to "a fight for market share in international oil and iron ore markets as well as general unease over lacklustre global economic conditions and an almost ‘deflationary’ environment." Apart from iron ore and oil where a market glut explains most of the downside, bellwether copper has been one of the hardest hit commodities. In New York trade on Friday copper futures advanced nearly 2% on the back of a huge rally in oil and a comeback in the gold price, but at $2.50 a pound remains near mid-2009 lows. Patricia Mohr, Scotiabank economist and commodity specialist, points out that even today's price "yields a slight 10% profit margin over average world breakeven costs including depreciation" and that the red metal has likely been oversold. Copper has likely been ‘over-sold’, given the fifth-highest imports into China on record in December, new fiscal stimulus by Beijing to spur the economy (speeding up spending on 300 infrastructure projects) and a planned 24% increase in capital spending by the State Electricity Grid (likely geared towards copper cable). Mining companies have recently cut projected output for 2015 by 300,000 tonnes (Rio Tinto at Kennecott, BHP Billiton at Escondida and Glencore at Alumbrera), helping to trim an expected surplus this year to a modest 250,000 tonnes. India is the world’s second-largest importer of gold,1 currently taking in around 800 tonnes per year.2 In India, gold trades at a premium to international prices because of the hefty import duties and high domestic demand. Jayant Bhandari advises funds and institutional investors on investing in India, and has commented on India’s impact on world gold demand for Sprott’s Thoughts. In his last contribution, he said that India’s demand for gold would not be threatened by the heavy import tariffs that the government imposed in 2013. Smuggling and bribery would undermine government measures, he said. Now the Indian government is reversing its efforts to curtail gold imports, and gold importers expect a drop in import tariffs to be announced in the upcoming federal budget. As a result of the expected tariff cut, gold is trading 10% higher than international prices compared to about 12% or 13% higher a month back. As the import tax is a high 11.3%, gold traded at a slight premium to the official price, but now it trades at a slight discount. 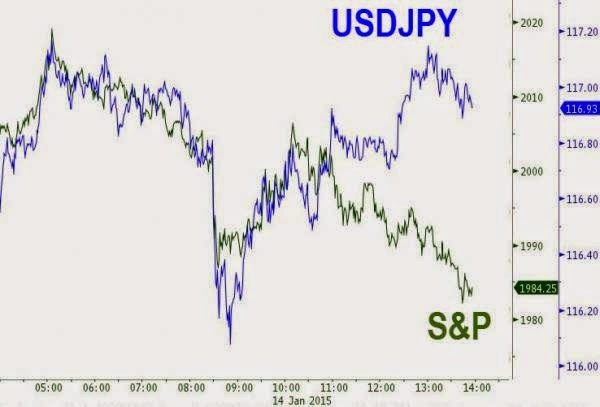 The reason is that traders and jewelers are reducing their stocks — it makes no sense for them to be stuck with gold when the price is expected to come down. Now, Western media outlets (CNBC, e.g.) 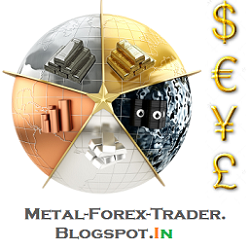 are thinking that a reduction in the import duty will suddenly increase the availability and demand for gold. Availability was never a problem. Gold continues to be a very liquid commodity in India, with almost no spread. I don't think that a few percentage points’ reduction in the price of gold will make a noticeable difference to demand. A tariff cut will not lead to suddenly higher imports from India. I have been telling people in India to load up on gold, for three reasons. The economy is not doing well. Foreign and Indian investors have been hoping for big infrastructural projects and a significant liberalization of the economy to occur under the new Prime Minister, Narednra Modi. But the present government has done almost nothing in that direction. Modi is a darling of the public for now, so the market still believes he will eventually do a lot for the economy. Foreign investors are enamored of Modi for his lip service for a more free market system. People are hoping that the next federal budget will be a magic wand, bringing adjustments that will put the economy on the growth path painlessly. The truth is that entrenched interests from his own party would never let this happen, even if this were what the Prime Minister really wanted. India’s currency keeps falling. As of January 29, it is down 6% in US dollar terms since its high during Modi’s inauguration in May 2014. This comes despite massive help from cheaper oil, which is India's biggest import commodity. Lower oil prices have slashed India's import bill. But it hasn’t stopped the Rupee from going lower. This tells you how weak the Indian export economy really is. People typically leave out currency devaluation when looking at stock market performance, leading them to think that the Indian stock market has done better than it has in real terms. Now, of course, it has done well, even when adjusted for the Rupee's devaluation, but in my view it is one of the most over-priced stock markets today. Remember that Indians don't have many possibilities for moving their money abroad. So they generally must invest in domestic stocks and properties. India’s property market is extremely expensive. Your rental yield, around 3%,4 is much lower than the official interest rate of 7.75%.5 So investors are left to hope that property prices keep increasing unhindered by the reality of rents. Based on these three reasons, I think the economy will continue to do badly and the stock and property markets will fall significantly going forward. When this happens, people will look to gold as a store of value. So in my view, gold is a good place to be if you live in India. 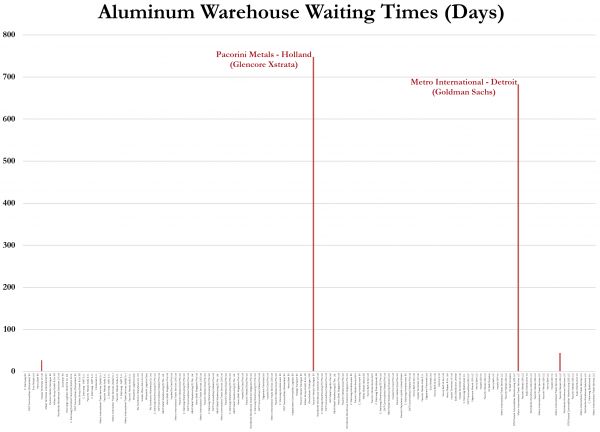 I expect that demand will continue to be strong, although tariff changes are likely to have only a small effect. Chilean state copper commission Cochilco cut its forecast on Thursday for 2015 average copper prices to $2.85 per pound, from a prior $3.00 estimate, amid a collapse in commodities prices, a strengthening U.S. dollar, and worries about top consumer China. It also forecast average copper prices of $2.80 per pound in 2016. Prices for the industrial metal have been hovering near 5-1/2 year lows. 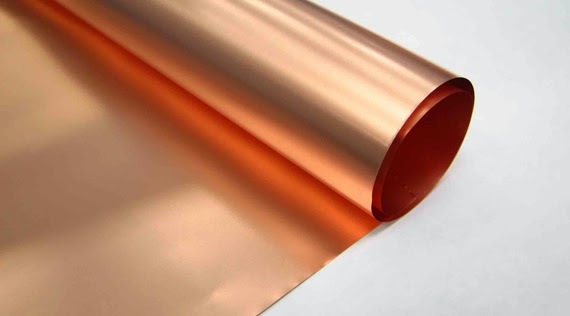 Concerns about global economic growth and demand for metals in China, which accounts for 40 percent of global refined copper demand, have kept the pressure on prices. "The forecast for copper prices this year assumes a recovery in the copper market starting in the second half of the year once prices find an equilibrium, uncertainty about China is dispelled and investors adjust their risk aversion," Cochilco said. 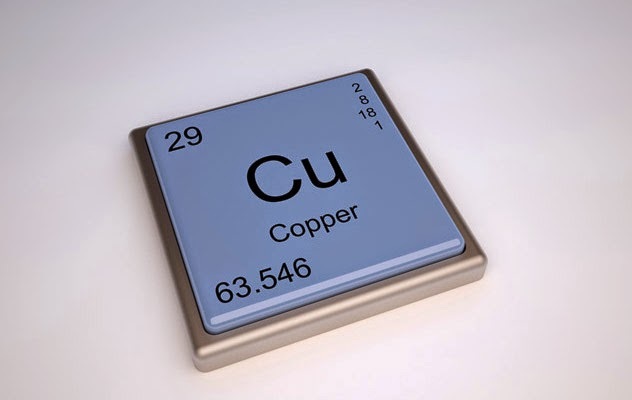 Top copper exporter Chile is expected to produce 6 million tonnes of copper in 2015, said Cochilco, who had previously forecast output of 6.23 million tonnes for the year. That compares to the 5.78 million tonnes produced in 2014, according to data published earlier in the day by the government's INE statistics agency. Cochilco also forecast a surplus in the global copper market of 275,000 tonnes in 2015 and 404,000 tonnes in 2016. In heavy trade of more than 22m ounces by lunchtime in New York, gold for delivery in April fell over $35 an ounce or 2.8% from Wednesday's close hitting a low of $1,251.84 an ounce – the lowest in two weeks and the worst trading day in more than a year. Gold's gains this year have been ascribed to safe haven buying amid currency turmoil, a slowing global economy, the continuing fallout of the collapse in oil prices and a crisis in the Eurozone. But with the first hike in more than six year likely at the Fed's June meeting raising the opportunity costs of holding gold because the metal provides no yield, gold traders refocused their attention on fundamental factors. 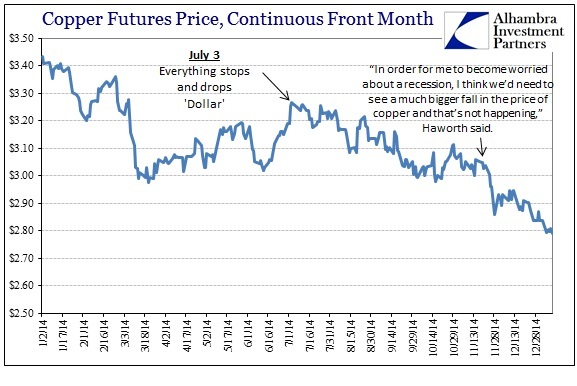 The consensus forecast seem to be that today's decline was only the beginning and the gold price will trend weaker in 2015 – the third year in a row. According to a new survey by the London Bullion Market Association of 35 analysts, gold will trade in a narrow band this year to average $1,211 a troy ounce with a range between $1,085 to $1,356 during the year. Ross Norman of Sharps Pixley is the most bullish analyst with a forecast of $1,321 average and a $1,450 high. Norman has been the most accurate forecaster in recent years coming in as the outright winner five times and a runner up four times. 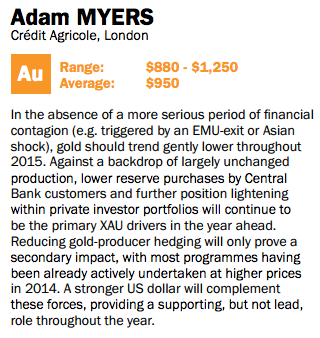 Adam Myers of Credit Agricole is the most bearish with $950 as an average and a low point of $880. Myers is one of five analysts predicting a dip below $1,000 this year. Last year analysts were bearish on gold, forecasting a price of $1,219, according to the LBMA. The gold price averaged $1,267 in 2014, some 4% higher than estimated. Silver, the worst performing of the four metals in 2014, is forecast to increase in price by 2.1%. Forecasters are more bullish about the prospects of the PGM prices, with platinum predicted to be the best performing with an increase of 5.6% and palladium forecast to increase by 5.3%. Click here for the full report from the LBMA. 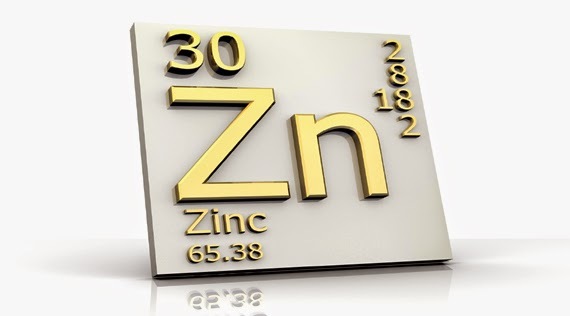 The price of zinc will perform strongly during Q1 2015 due to favorable market fundamentals, to outshine other metals, Futures Daily said in a research note. "Despite the broad sell-off in nonferrous metals market, zinc has held up quite well recently, and zinc will lurch higher once the dollar softens," it foresees. China is expected to see a lower growth of zinc output due to tightening ore supply worldwide and acceleration of inefficient capacity elimination in China. 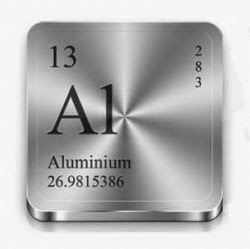 Zinc demand in China, reflected by high output of galvanized plate/sheet, is strong. Production of galvanized plate/sheet hit a new record high of 4.82 million tonnes in December 2014, thanks to growing consumption in the automobile sector and robust exports. Moreover, exchange inventories, both in SHFE and LME, have been falling, which will also give a boost to zinc prices. "King Dollar" met Queen Caterpillar this week and awoke the beast of broken narratives that a strong dollar may not be the 'unambiguously good' thing so many proclaim it to be. However, with the rest of the world competitively weakening their currencies (in order to 'help' their economies), we hope the chart above will help readers decide which they prefer... a stronger (US multinational-crushing) dollar or a weak (domestic drag) dollar? Turnover of commodity exchanges fell 43 per cent to Rs 48.54 lakh crore till January 15 this fiscal due to poor participation. According to the Forward Markets Commission (FMC), these exchanges had generated business worth Rs 85.28 lakh crore between April and January 15 last financial year. According to the latest data released by the Forward Markets Commission, there was decline in turnover in almost all commodities. The maximum decline in turnover was reported in bullion, metals, energy and agricultural commodities. Turnover from bullion fell 54 per cent to Rs 17.17 lakh crore during April-January 15 of this fiscal from Rs 37.39 lakh crore in the year-ago period. Similarly, the business from base metals like copper declined 39 per cent to Rs 12.48 lakh crore from Rs 20.49 lakh crore, while the turnover from energy items fell 34 per cent to Rs 10.07 lakh crore from Rs 15.14 lakh crore. Turnover from agriculture commodities dropped 28 per cent to Rs 8.81 lakh crore during the April-January 15 period of this fiscal against Rs 12.25 lakh crore in the same period previous year, the FMC data showed. Experts said lack of volatility in commodities market and high transaction cost have kept many investors at bay, while the Rs 5,600-crore scam at the commodity spot exchange NSEL has also dented investor confidence. 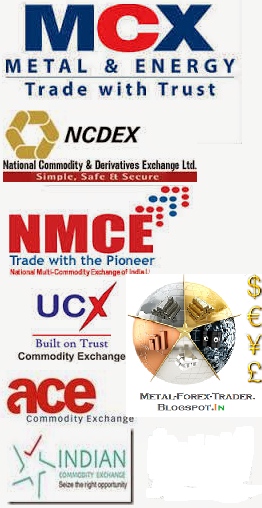 Currently, there are four national-level and six regional-level commodity exchanges operating in the country. 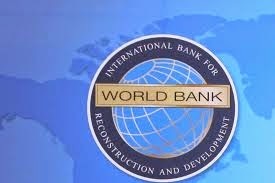 This year may well see a rare occurrence for world commodity markets – a decline in all nine key commodity price indices, says the World Bank’s latest Commodity Markets Outlook, released on Thursday. Oil prices have seen the most dramatic decline with iron ore a close second, but all commodity categories except beverages and food other than grains, oils and fats were softer last year. This broad-based weakness is expected to continue throughout 2015 says the bank. 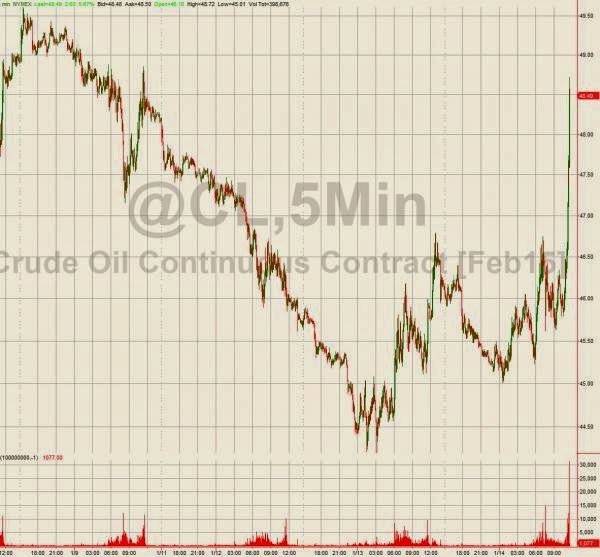 Oil enjoyed a rare up day to trade at $47.50 on Thursday after news of the death of the Saudi king, but prices are still down 56% from the most recent high of $108 per barrel in mid-June 2014. That's the third largest decline since World War II – previous records of a 7-month decline of 67% were set in 1985–86 and during the global financial crisis in 2008 which saw a 75% drop. "Both the current oil price collapse and the one experienced in 1985/86 followed an increase in oil production from unconventional sources and OPEC’s abandonment of price targeting." The World Bank forecast sees oil prices averaging $53 per barrel in 2015, 45% lower than in 2014. The weakness in oil prices is likely to impact trends in other commodity prices, in particular those of natural gas, fertilizers, and food commodities. Metal prices are forecast to drop 5.3% in 2015 compared to a 6.6% fall in 2014, while more moderate declines are foreseen for fertilizers and precious metals. A pullback of 2.9% in precious metal prices will result mainly from waning interest by institutional investors. The moderation in natural gas prices is expected to lead to a 2.1% decrease in fertilizer prices according to the report. According to the organization next year a recovery in the prices of certain commodities may likely get underway "although the increases will be small compared to the depths already reached." After a small hike, the price of the commodity is expected to decline, it might even slump below 2,000 dollars per tonne by 2017. Simon Hunt, a global copper analyst as well as economist stated that, the price of copper will stabilize in the second quarter of the year, and from the beginning of third quarter, the price of the commodity will start to hike and there is also a chance that the price of the commodity might reach to a record of 10,000 dollars per tonne by the end of 2015 or by the beginning of 2016, and then the commodity will begin its downward journey again. He was speaking at the MCC Chamber of Commerce and Industry. He forecast that, the price of copper might decline even lower to 2,000 dollars per tonne by the year 2017. 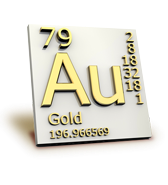 When he was asked about the condition of other metals he stated that, all the other metals are likely to share the similar fate, one way or the other, except for gold . 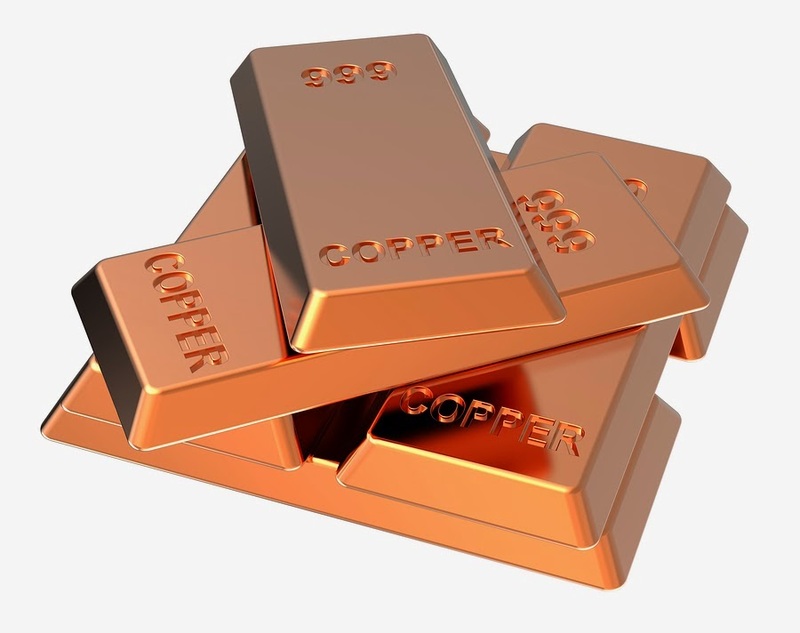 The value of copper has been declining, and is staying at the present around 5,000-5,500 dollars per tonne. According to the reports, even though the global market is facing a supply glut at the moment, the supply outlook for 2015, has been reduced from 400,000 tonnes to 100,000 tonnes. 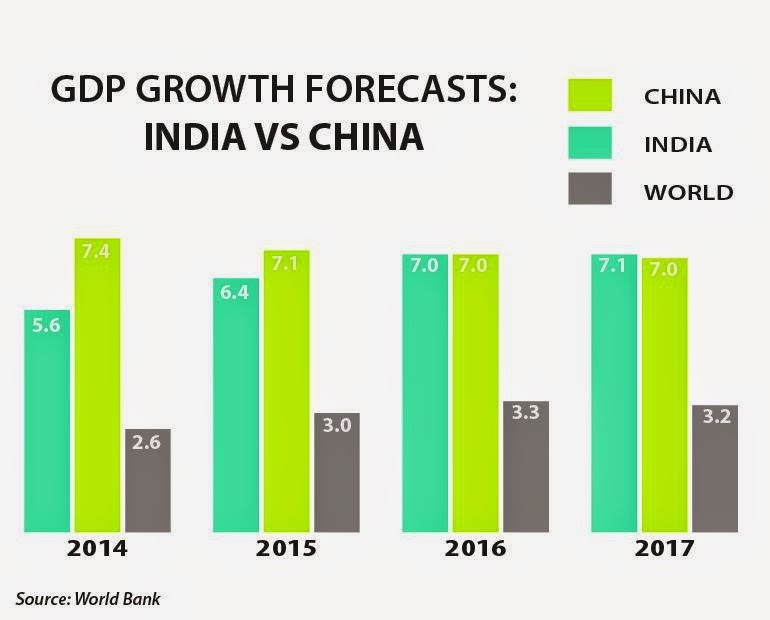 Hunt expects that, the global market will grow on a smaller pace in the 2015, but he still isn't sure about its effect in India. The value of the commodity, declined to 6.2percent last week, which was the biggest decline since the year 2011, after the World Bank cut down its forecast for the world economy. The decline in energy prices has also affected the price of metal prices, by declining the cost of production, forcing the companies to cut down the price, stated Morgan Stanley. Tom Price stated on his report that, the bank stays bullish regarding the copper outlook. The bank also stated that, it was surprised on the latest move by copper price. The almost 50 percent decline in the price of the oil, over the past year, has also declined the production cost copper by about 5 percent. From July 2014 to 12th January 2015, the 90 percent of changes in the price of copper is due to the change in price of oil. 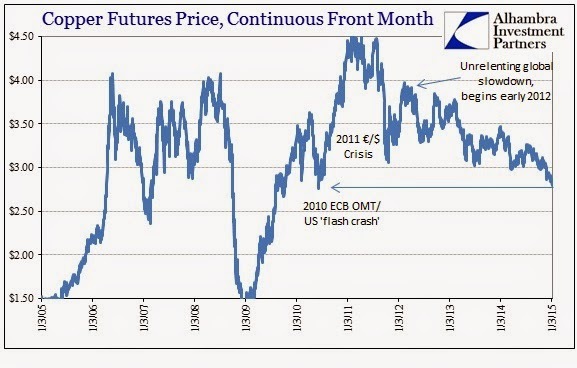 But last week the connection between the two commodities broke, the value of copper declined to fast to too low. 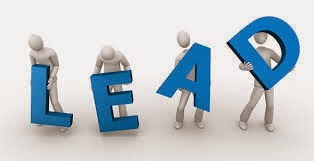 The latest statistics published by the International Lead and Zinc Study Group (ILZSG) indicates that global refined lead market was in surplus of 1,000 tons during the initial eleven-month period in 2014. 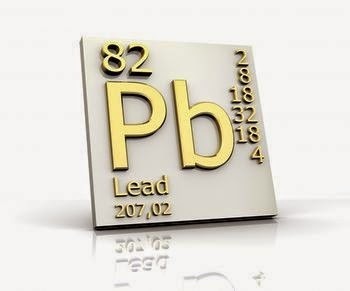 The total reported lead inventories declined by 40,000 tons during the same period. The lead mine production in Australia, Peru and the United States increased during the eleven-month period. But they were enough to partially cover the decline in production in other countries such as Bolivia, South Africa and China. The overall global lead mine production reduced by 2.8% when compared with the corresponding eleven-month period in 2013. The world lead mine output during the ten-month period totaled 4.836 million tons as against 5.435 million tons during 2013. The refined lead metal production during the eleven-month period totaled 10.300 million tons, 1.24% higher when compared with the 10.174 million tons output during corresponding eleven-month period in 2013. The refined lead metal production surged higher in China, India, Italy, Kazakhstan and the Republic of Korea, whereas it declined sharply in Japan and the US. The global demand for refined lead metal increased by 1% to 10.299 million tons during the initial eleven-month period in 2014. The European apparent usage increased by 2.3%. China reported a demand rise of 1.2%. The apparent consumption in the US dropped by 0.6%. Total Gold ETF physical holdings rose 0.85% on Friday (following Thursday's 0.78% rise) combining for thebiggest 2-day rise since Nov 2011 (adding 843,000 ounces of gold in 2 days). 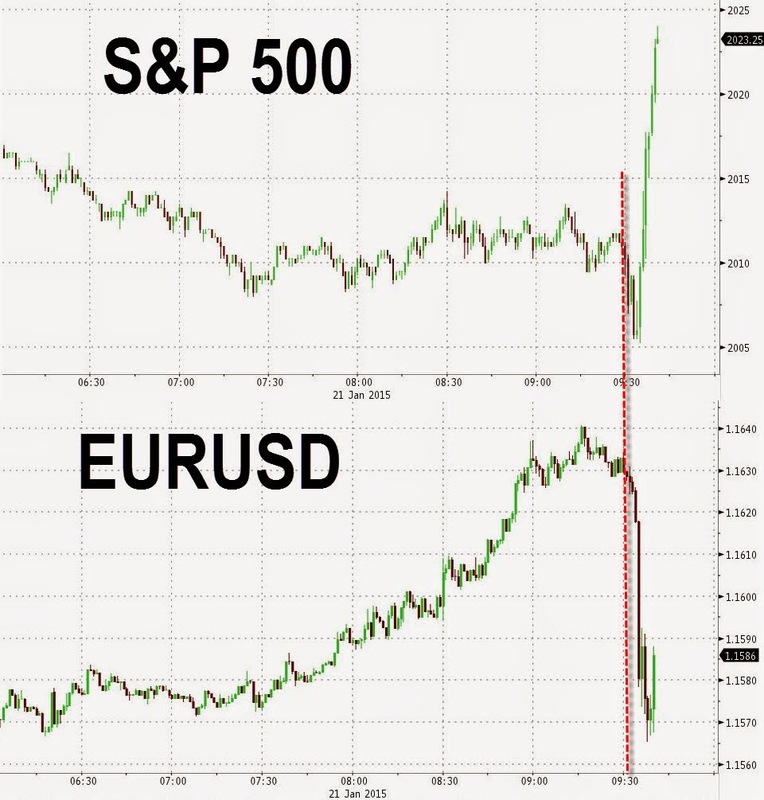 Of course these moves came right after the SNB decision ands are the largest since the peg was announced in 2011. GLD - the largest gold ETF - saw holdings surge 1.9% on Friday, the biggest single-day surge in almost 5 years. Of course, once again this shows that only paper gold matters for price determination... physical is irrelevant (until of course, physical is all that matters). The latest statistics published by the International Lead and Zinc Study Group (ILZSG) indicates that global refined zinc market was in deficit of 255,000 tons during the initial eleven-month period in 2014. 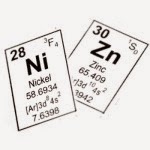 The total reported zinc inventories declined by 326,000 tons during the same period. The zinc mine output reported declines in Australia, Canada, India, Ireland and Namibia. However, the fall in output was covered with the increased mine output from other countries including China, Mexico, Peru, Sweden and the United Sates. Overall, the zinc mine output grew by 1.9% during the initial eleven months of 2014, in comparison with the previous year. The refined zinc metal production during the eleven-month period totaled 12.296 million tons, 4.16% higher when compared with the 11.805 million tons output during corresponding eleven-month period in 2013. The rise in refined zinc metal output was mainly due to increased output from China. The global demand for refined zinc metal increased by 5.4% to 12.551 million tons during the initial eleven-month period in 2014. The Chinese apparent usage increased by 10.5%. The US reported a demand rise of 3.9%. On the other hand, apparent consumption in the Europe region declined by 1.6%. The global mine production during the month of Nov ’14 alone totaled 1.213 million tons. The refined zinc metal output during the month totaled 1.207 million tons. The global demand for the metal totaled 1.190 million tons during the month. The decline of the commodity will hike by the expected decline in the Chinese Economy, which accounts for 45 percent of the global demand and there is also a forecast of the increase in the supplies in the mine this year and also in the year that follows. The estimates of Wall Street show that, the increase in supply might be off the base. The mining giant Glencore PLC, also agreed with the estimation. The company is the biggest supplier of copper in the world. The company also stated that, forecast of surplus in the year 2015 will be very small, based on the past surplus, and the chances are less that, the decline will move further outward. The company also added that, it wouldn’t be surprised to see a deficit in the year 2015. 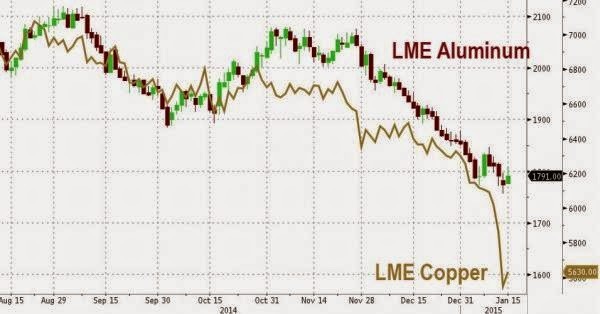 China’s GDP Release to Trigger Further Copper Price Falls? Market focus has shifted to the China Q4 GDP figure due for release next week, which is expected to slow significantly. Bloomberg predicts that China’s growth will slow to 7.2% in the final quarter of 2014. Will copper prices present a renewed decline on poor data from China? “Copper prices are likely to slide should the GDP data turn out poor, but the impact will be limited as the result is somewhat within market expectation,” an analyst from Shanghai CIFCO told SMM. Analyst from Jinrui Futures also reckons that copper market may not be significant affected even if the economic indicator proves weak, as market prediction is for the economy to slow. “The bad data might have been priced in,” the analyst explains. Tightening supply of both primary and secondary lead is likely to bolster physical lead prices in China, says Zhu Rongrong, an analyst with Shanghai Metals Market. Low secondary lead prices largely squeezed margins for smelters, leaving even unlicensed smelters unprofitable. This has resulted in massive stoppages in late 2014, especially at those unlicensed companies. Furthermore, Anhui’s Huaxin Lead Industry Group has shut down smelters in its old factory zone due to a failure to meet environmental protection requirements. 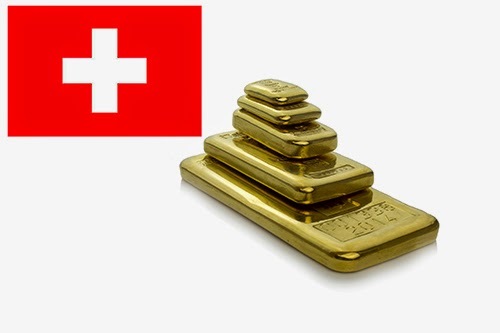 Gold on Thursday shot higher after Switzerland's central bank scrapped efforts to keep the franc from appreciating sending shockwaves through financial markets already in turmoil as a result of a stock market plunge, the oil price slide and the collapse in copper this week. In later morning trade on the Comex division of the New York Mercantile Exchange gold for February delivery soared to a high of $1,267.20 an ounce, up $32.70 or 2.5% from Wednesday's close. 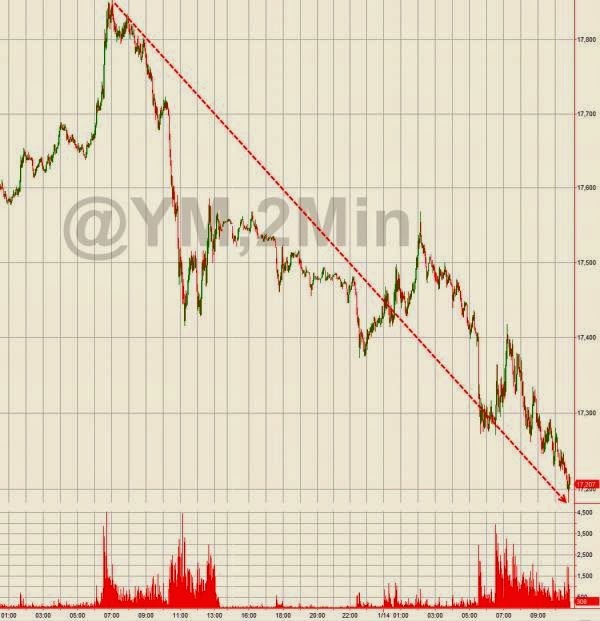 Volumes were nearly double recent trading session with 23.7 million ounces changing hands by lunchtime. Gold is now trading at its highest since September 5 and has jumped more than 7% jump so far this year. Gold has gained more than $120 from its near four-year low hit early November. After the announcement by the Swiss National Bank ended the currency cap the franc jumped 16% against the euro and more than 30% against the dollar as traders tried to figure out the impact on global financial markets. The SNB also entered further unchartered territory by cutting the interest rate on certain bank deposit account balances to -0.75% – that's minus three-quarters of a percent. Marc Faber, economist, investment guru and Wall Street stalwart, came out on Tuesday this week as the year's biggest gold bull, saying a collapse in confidence in the world's central banks could see gold rallying 30% this year.